Where the prawns want to be lobsters! 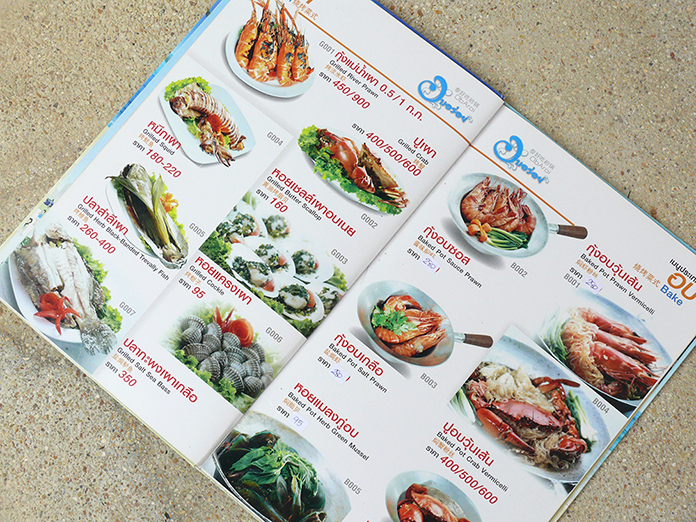 It was an easy trip to Jomtien Beach Road this week to locate a seafood restaurant, Ob Aroi, situated between Soi 10 and Soi 11. Looking at the new numbers for the sois it was actually very easy to find it. What was confusing was that Ob Aroi is actually two restaurants, either side of the entrance to Villa Navin. The Dining Out team was meeting at the restaurant, and it was a little time before we found that half the team was in one section of the restaurant on the left of the Villa Navin entrance and the other half was on the other side of Villa Navin entrance. Villa Navin you will know as it has been on Jomtien Beach Road for decades. 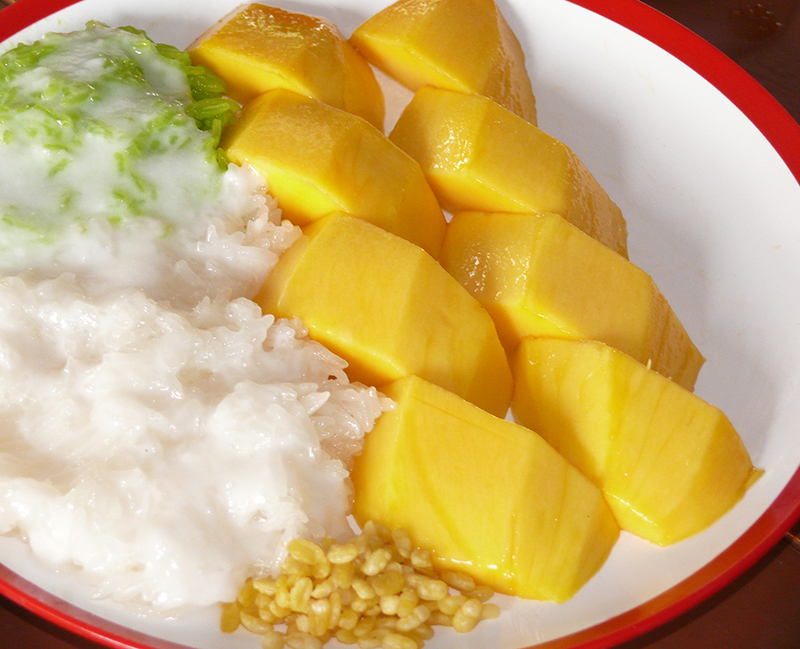 Popular mango and sticky rice dessert. The owner, Karnnimar Kinimarn (Kob), explained that she has another Ob Aroi in Bangkok. This began as a food cart with four tables selling noodles and then just got bigger from there, to the stage that it now has almost 100 tables and the restaurant is packed. With the expansion continuing, Kob has now come to Jomtien. With her, she brought down the most colorful menu (and the best we have seen in a long time). It is a most impressive affair and packed with photos. This is so necessary in a beach restaurant, where many of the diners do not speak or read English, though those who speak Thai, English or Mandarin are catered for. 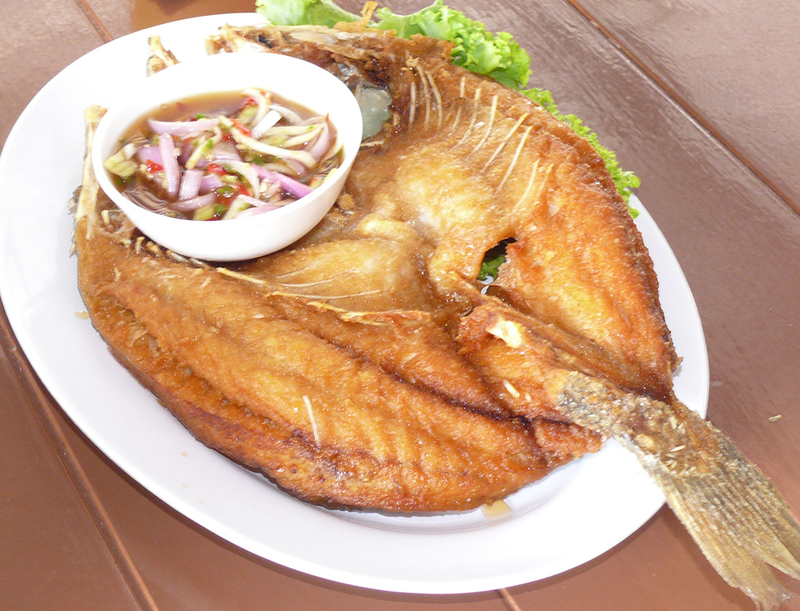 The menu begins with a page of chef’s recommendations which are quite varied, with deep-fried sea bass (B. 350), fried water mimosa with oyster sauce (B. 178), grilled butter scallop (B. 160) and deep-fried garlic squid (B. 200). Into the menu proper and the dishes are divided by method of cooking with grills as the first. River prawn are B. 450 to 900 and were large enough to be considered mini-lobsters, cockles are B. 95 and black banded trevally B. 260-400 according to size. Next up are baked with herb green mussels B. 95, followed by steam-boiled sculling crab B. 450 and steamed lime sea bass at B. 350 and a plate of mixed seafood (squid, fish, green mussels and shrimp) B. 220. Tom Yum Goong in the volcano. There are three pages of fried items, to show you the most popular ways to present seafood, including ones such as stir-fried grouper with celery at B. 260. Stir-fried morning glory with oyster sauce B. 100 and fried rice with crabmeat B. 80 or B. 160 for a family. Spicy salads are next (B. 140-260) for those who know how to handle chilies. 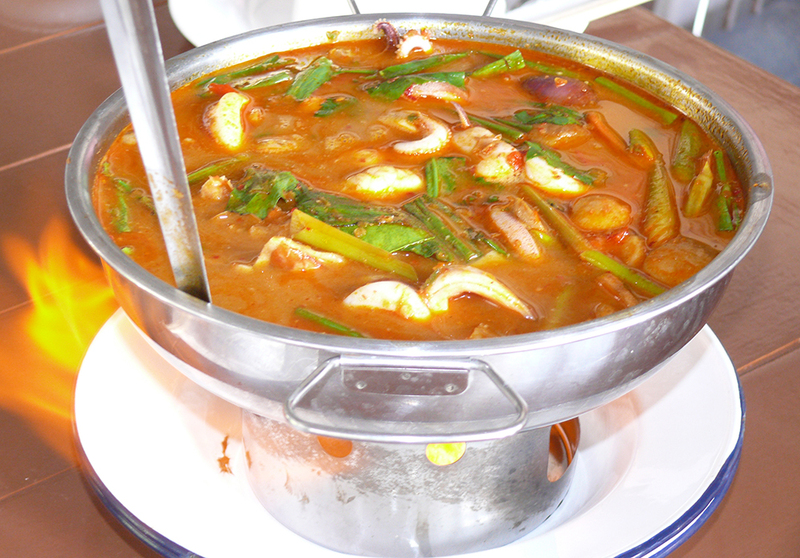 These are followed by spicy soups such as the perennial favorite Tom Yum Goong kept hot in the “volcano” dishes (B. 300). Desserts include the Thai mango and sticky rice at B. 160, while beers are generally around B. 80-115, bottled or draft. Ob Aroi is a welcome addition to the seafood restaurants on the Eastern Seaboard, and is noteworthy in having excellent food in a very clean restaurant (and toilet), something that is not always the case with this genre of restaurant. Prawns pretending to be lobsters. We were a group of eight and there was no consensus as to the most popular item, as every dish had someone who loved it! For me, it was either the deep fried sea bass or the grilled butter scallop, as although Ob Aroi does have international items we stuck to the seafood, which is the prime style. 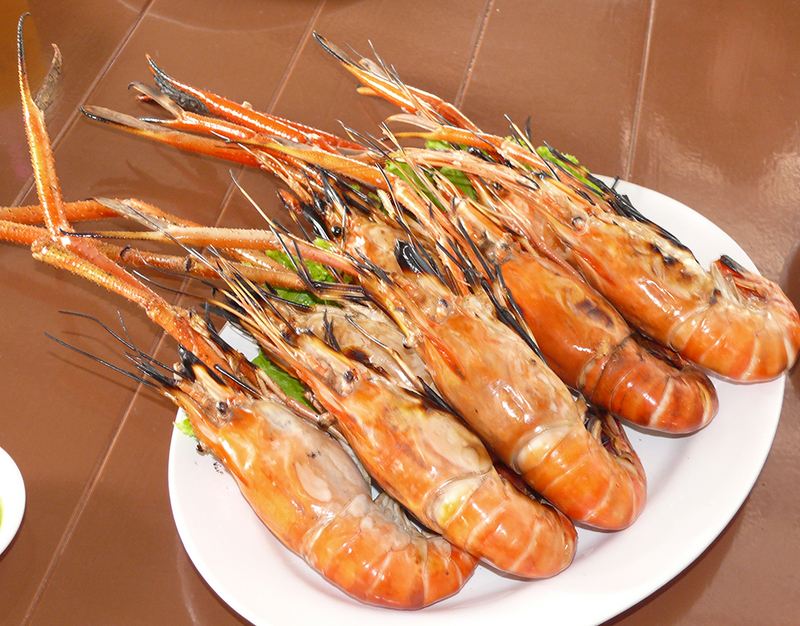 It is a fine example of Thai seafood cooking and will be an excellent venue to take overseas guests and family. Do try. Ob Aroi, Jomtien Beach Road, between Sois 10 and 11, open seven days, Mon-Friday 10.30 to 11 p.m., Saturday–Sunday 8 a.m. to 11 p.m., telephone 099 365 5655, 085 493 1419, plenty of on-street parking.